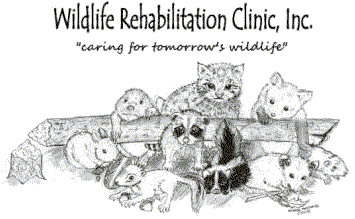 The Wildlife Rehabilitation Clinic is an all volunteer, non-profit 501(c)3 organization which specializes in the rehabilitation of native Missouri mammals and is licensed by the Missouri Department of Conservation. Founded in 1989, we are firmly committed to providing top-notch care for the animals in our care and are very proud of a release rate well above the national average. Our primary purpose is to care for injured and orphaned wildlife with successful release back into its natural habitat. We provide food, shelter and rehabilitative care for the animals in our facility and provide them with an opportunity to develop and recover in an environment that is reasonably natural for them, before returning them to the wild.